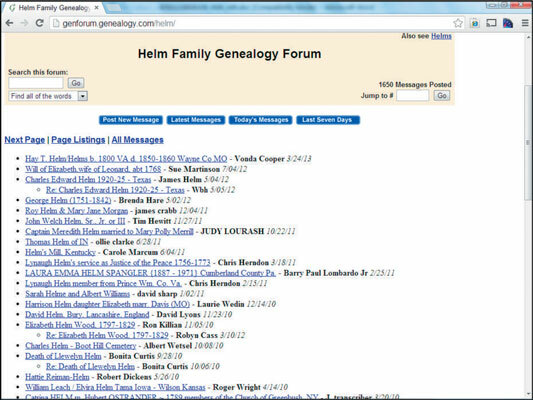 Even if you can’t find any surname-specific sites on your particular family, you still have hope for your genealogy! This hope comes in the form of queries. Queries are research questions that you post to a particular website, mailing list, or newsgroup so that other researchers can help you solve your research problems. Other researchers may have information that they haven’t yet made available about a family, or they may have seen some information on your family, even though it isn’t a branch that they’re actively researching. Open your web browser and go to GenForum. In the field below Forum Finder, type the surname you’re looking for and click Find. Feel free to enter a surname that interests you. If you feel like browsing the forums, you can also select a letter below the word Surnames. You may also want to search other forums to see whether the name is included in a variant spelling or whether someone else mentioned the name in a passing reference in another forum. After you find a forum, read a message by clicking its link. As soon as your browser loads the message board page, you should see a list of bulleted messages to choose from. You can also navigate to other pages of the message board if the messages don’t fit on a single page. If you don’t want to read all the messages, you have the option to see only the latest messages, only today’s messages, or any messages posted in the last seven days. These options are available at the top of the list of posted messages. To post a new query, click Post New Message at the top of the list of posted messages. If you’re not already a registered user of GenForum, you see a page with instructions on registering. If you’re already a registered user or after you become one, a page containing the fields that generate your message pops up. This page includes the name of the forum to which you’re posting, your name and e-mail address, the subject of the posting, and a free-form text field where you can enter your message. Fill out the appropriate fields and then click Preview Message. Make sure that your message contains enough information for other researchers to determine whether they can assist you. Include full names, birth and death dates, places (if known), and geographic locations where your ancestors lived (if known). Clicking the Preview Message button is an important step because you can see how the message will look when it’s posted. This option can prevent you from posting a message filled with those embarrassing typos. When you’re satisfied with the way the message looks, click Post Message.